This article is about the year 1311. Wikimedia Commons has media related to 1311 . Year 1311 ( MCCCXI ) was a common year starting on Friday (link will display the full calendar) of the Julian calendar. January 6 – Henry VII is crowned King of Italy in Milan, and on February 12 crushes a local local rebellion. October 16 – The Council of Vienne begins. An urprising of the Guelph faction in Milan led by Guido della Torre on 12 February 1311 was crushed by the troops of king Henry VII still on the same day. Lincoln Cathedral in England is completed; with the spire reaching around 525 feet (160 m),  it becomes the world's tallest structure (surpassing the Great Pyramid of Giza, which held the record for almost 4,000 years), a record it holds until the spire is blown down in 1549. Bolingbroke Castle is a ruined castle in Bolingbroke Lincolnshire, England. Year 1356 (MCCCLVI) was a leap year starting on Friday of the Julian calendar. Margaret II of Avesnes was Countess of Hainaut and Countess of Holland from 1345 to 1356. She was Holy Roman Empress and Queen of Germany by marriage to Emperor Louis IV the Bavarian. January 28 is the 28th day of the year in the Gregorian calendar. There are 337 days remaining until the end of the year. Year 1312 (MCCCXII) was a leap year starting on Saturday of the Julian calendar. January 27 is the 27th day of the year in the Gregorian calendar. There are 338 days remaining until the end of the year. The 1310s was a decade of the Julian Calendar which began on January 1, 1310, and ended on December 31, 1319. Year 1093 (MXCIII) was a common year starting on Saturday of the Julian calendar. Year 1205 (MCCV) was a common year starting on Saturday of the Julian calendar. Year 1344 (MCCCXLIV) was a leap year starting on Thursday of the Julian calendar. The Duchy of Athens was one of the Crusader states set up in Greece after the conquest of the Byzantine Empire during the Fourth Crusade, encompassing the regions of Attica and Boeotia, and surviving until its conquest by the Ottoman Empire in the 15th century. Walter VI was Count of Brienne, Conversano, and Lecce, and titular Duke of Athens as Walter II. Walter V of Brienne was Duke of Athens from 1308 until his death. Being the only son of Hugh of Brienne and Isabella de la Roche, Walter was the sole heir to large estates in France, the Kingdom of Naples and the Peloponnese. He was held in custody in the Sicilian castle of Augusta between 1287 and 1296 or 1297 to secure the payment of his father's ransom to the Aragonese admiral, Roger of Lauria. When his father died fighting against Lauria in 1296, Walter inherited the County of Brienne in France, and the Counties of Lecce and Conversano in southern Italy. He was released, but he was captured during a Neapolitan invasion of Sicily in 1299. His second captivity lasted until the Treaty of Caltabellotta in 1302. Isabella of Brienne (1306–1360) was suo jure Countess of Lecce and Conversano, claimant to the Duchy of Athens and Kingdom of Jerusalem, etc. Hugh, Count of Brienne and Lecce was the second surviving son of Count Walter IV of Brienne and Marie de Lusignan of Cyprus. Louis of Enghien titular Duke of Athens, Count of Brienne and Lord of Enghien in 1381–1394, Count of Conversano in 1356–1394. His coat-of-arms was "Enghien, a label gules bezantee". The County of Brienne was a medieval county in France centered on Brienne-le-Château. Roger Deslaur or Desllor, an almogàver from Roussillon in the service of Walter V of Brienne, Duke of Athens, was one of the few knights to survive the bloody Battle of Halmyros on 15 March 1311. Captured by the Catalan Company, he accepted the post of rector and marshal of the Company after Boniface of Verona declined it. Joanna of Châtillon or Joan, French: Jeanne; was the wife of Walter V of Brienne (1305). She was Duchess of Athens by marriage (1308–1311). She was the daughter of Gaucher V de Châtillon, Constable of France and Isabelle de Dreux. Her paternal grandparents were Gaucher IV de Châtillon and Isabelle de Villehardouin. Her maternal grandparents were Robert de Dreux, Viscount of Chateaudun and Isabelle de Villebéon. Events from the 1310s in England. Marguerite d'Enghien, suo jure Countess of Brienne and of Conversano, suo jure Heiress of Enghien, and Lady of Beauvois, was a wealthy noblewoman from the County of Hainaut in her own right, having inherited the counties of Brienne and of Conversano, and the Lordship of Enghien from her father Louis of Enghien on 17 March 1394. She was the wife of John of Luxembourg, Sire of Beauvois and the mother of Peter of Luxembourg, Count of Saint-Pol, Count of Brienne and of Conversano who inherited her fiefs, and John II of Luxembourg, Count of Ligny. 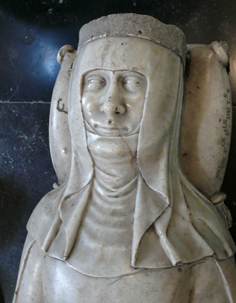 Margaret of Bar (1220–1275) was a daughter of Henry II of Bar and his wife Philippa of Dreux. She was Countess of Luxembourg by her marriage to Henry V of Luxembourg. She is also known as Marguerite of Bar. Isabella de la Roche was a daughter of Guy I de la Roche. She was married twice, firstly to Geoffrey of Briel, Lord of Karytaina and then secondly to Hugh, Count of Brienne, having children only with her second husband. ↑ Lock, Peter (2013). The Routledge Companion to the Crusades. Routledge. p. 125. ISBN 9781135131371. ↑ Palmer, Alan; Palmer, Veronica (1992). The Chronology of British History. London: Century Ltd. pp. 95–98. ISBN 0-7126-5616-2. ↑ "Lincoln Cathedral". Skyscraper News. 2009-08-25. Retrieved 2012-02-22.